This post is a copy of the Guest Blog post we wrote for the IBM Holiday Readiness Blog series on December 10, 2015. This article was published in the IBM Commerce blog and can be found here. The mobile trends this holiday season are continuing from previous holiday seasons and not surprisingly mobile traffic and sales continue to outpace the broader market. The following graph from IBM Watson Trend Hub shows the mobile site traffic and % of sales data for Black Friday in 2015 compared to the previous 5 years. 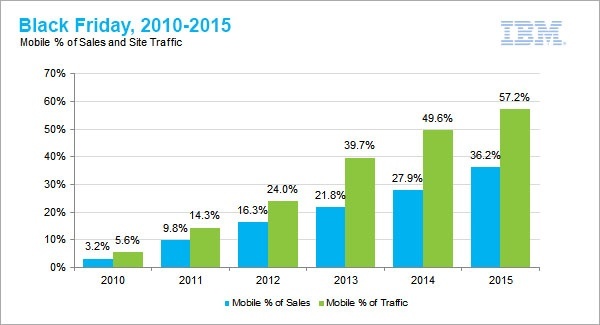 It is interesting to note that mobile traffic exceeded traditional website traffic for the first time and that mobile now accounts for more than one third of sales increasing 30% year to year. Within mobile, smartphone traffic is far outpacing tablets and Apple is the preferred smartphone for shoppers. You can see the complete report for Black Friday and Cyber Monday by clicking on one of the links for IBM Watson Trend Hub. A great app not only works flawlessly, it also provides immediate and relevant mobile moments. Great apps increase revenue, reduce cost, and engage customers exponentially more than good apps. Firms must invest to create great apps. Firms must measure the things that will lead them to create great mobile apps. To highlight a couple of key points, the study found that great apps generate an average of five times more revenue than a good app. In addition, they lower costs by decreasing operational costs and improving employee productivity. Finally, there are demonstrable improvements in customer loyalty, engagement and experience. Over time this creates a compounding financial impact. In addition, companies with great apps track the transaction volumes, cost savings, revenue generated, average revenue per user, engagement, and customer satisfaction. I would encourage you to download and read the full report, Why Good Apps Are Not Good Enough. If you accept that great mobile apps have a compounding financial benefit over good apps, then it should come as no surprise that the ROI for enterprises that leverage customer experience analytics to create great apps are extremely high. IBM commissioned Forrester Consulting earlier in the year to perform another study that evaluated the Total Economic Impact of IBM Tealeaf CX Mobile. Forrester worked with IBM to analyze the total economic impact that CX Mobile had on a number of customers. The study concluded that customers that had implemented CX Mobile customer experience analytics realized an ROI of 196% with a payback of 4.7 months. The following diagram highlights some of the benefits; including increased conversion rates, improved customer retention, and operational cost savings that were identified in producing these financial results. Companies that invest in mobile customer experience analytics achieve compelling returns on their investments. When you combine this with the financial impact of producing great mobile apps and the need for a robust mobile analytic platform to build great mobile apps, the need for mobile customer experience analytics is clear. As this holiday season is showing, the growth in mobile traffic and sales is continuing and creating an essential and compelling reason to have a methodical approach to mobile customer experience analytics. Please click below if you woud like to request information on IBM Tealeaf CX Mobile.